I love it when a plan comes together, when a dish in your imagination turns out as delicious as the actual experiment. This is one such meal. Last night I put a little gourmet Italian twist on southern-style Shrimp n’ Grits, then added a serving of smoky-garlicky greens as a side. The results? Not only was the presentation gorgeous, it tasted heavenly. 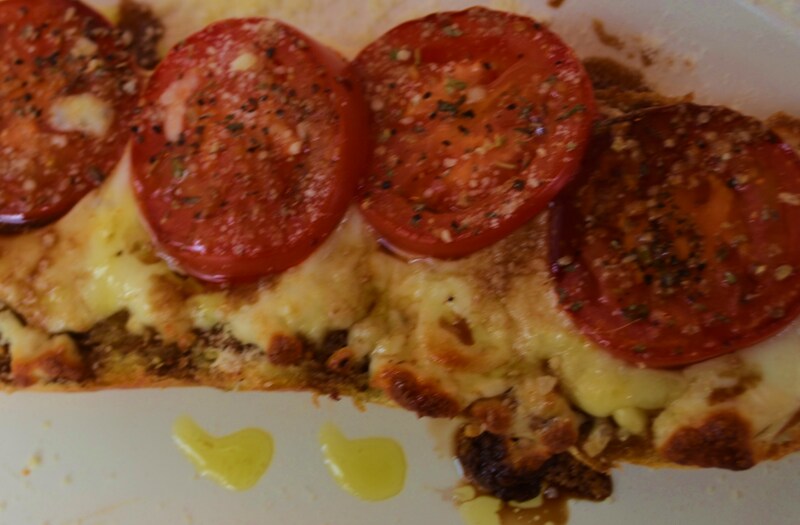 As in I would absolutely put a this recipe in the category of “the perfect bite” and serve it up in a spoon to Nigella Lawson and Anthony Bourdain on the show “The Taste”. Then step back and wait for them to swoon and hand me the prize without further debate. 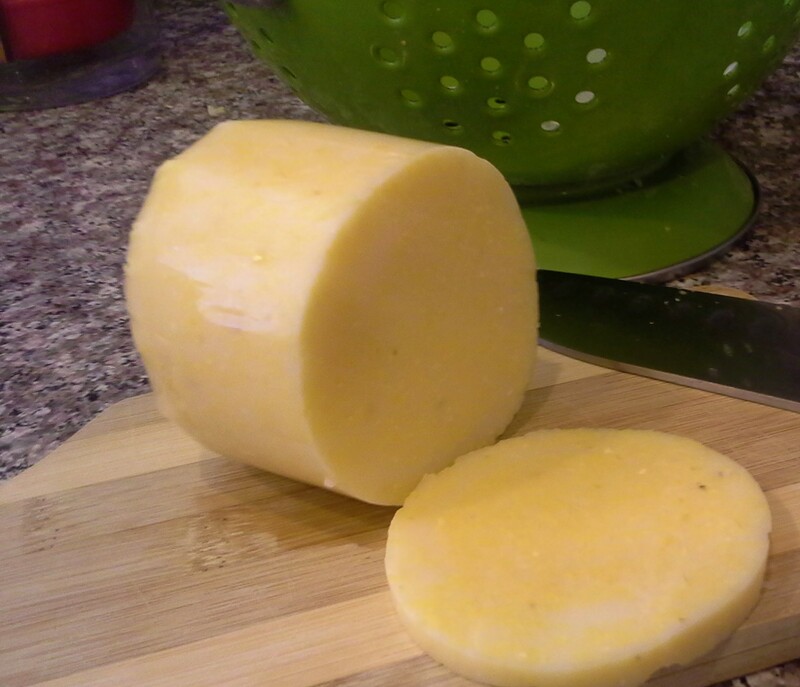 In place of the traditional grits, I pan-fried thin slices of ready-made polenta, often used in Italian recipes. I used Trader Joe’s brand, which comes in package shelf (not refrigerated), usually near the Italian section of the store. It looks like moist, cooked cornmeal made into a log and wrapped in plastic. That is because, well, it is. It is not the most appetizing looking food when you open it up for slicing. (Think yellow corn grits that may have been left too long in a pan.) However, once you’ve pan-fried them in olive oil and butter, with a little salt and pepper…. Look out, Louise. They turn into crispy-edged, buttery disks of corny decadence. 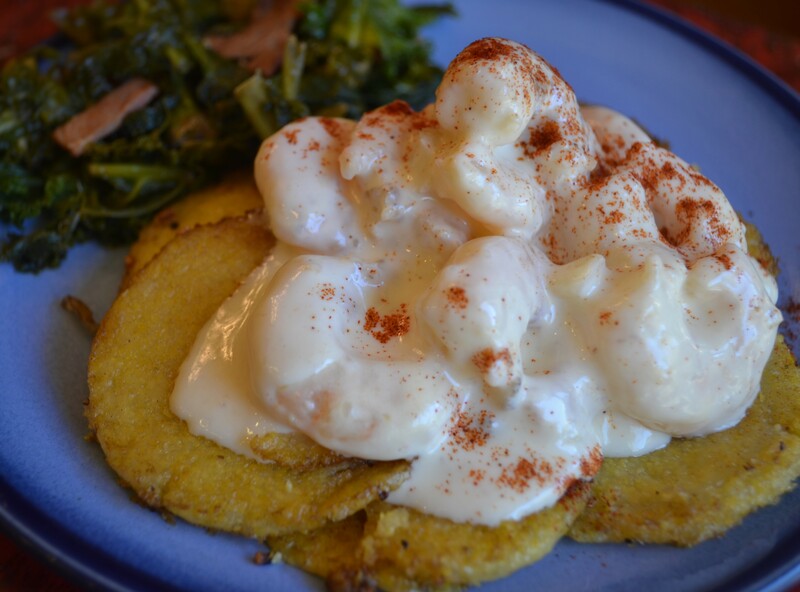 I made a quick n’ easy, creamy Alfredo sauce for the shrimp and paired it side dish of greens– a mixture of kale and some wonderful fresh greens, a gift from our neighbor’s garden. 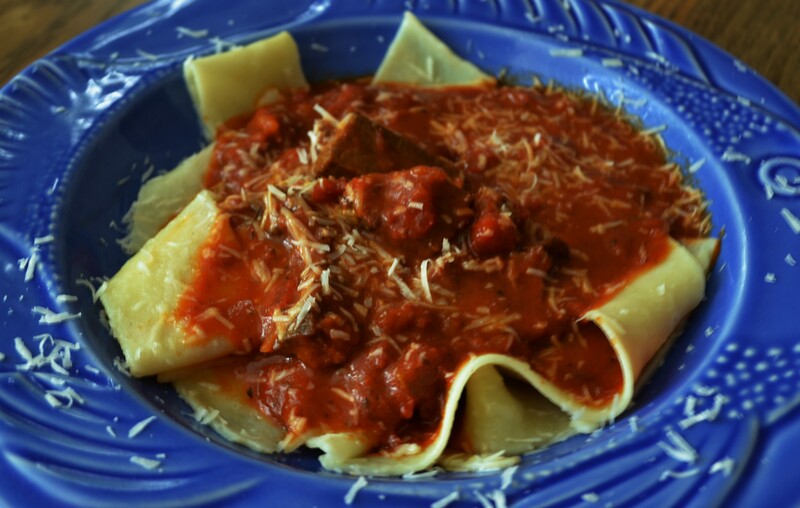 I can’t wait for you to try this recipe, a Taste of Tuscany meets South in Your Mouth. In another skillet (I like my iron skillet) let oil and butter melt and get hot while you slice the polenta into ¼ inch or so rounds. 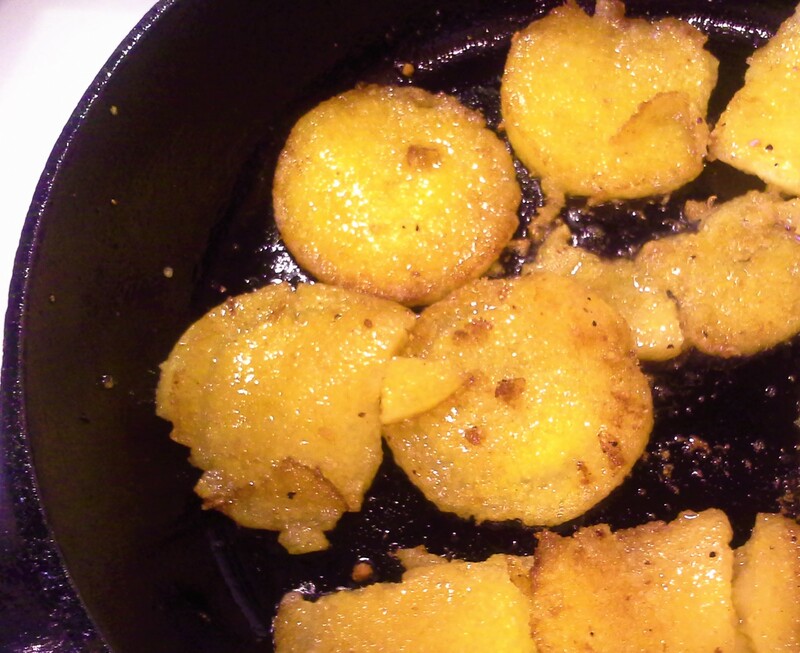 Place the rounds in the skillet and turn heat up to medium high so that the polenta starts to pan fry. When it is golden brown in places, turn it over and brown the other side. Sprinkle the tops very lightly with salt and pepper. Remove to a paper towel to drain any excess grease, then cover with another paper town to keep warm. Wipe out the iron skillet with a paper towel, and then put in oil and garlic and shrimp. Cook for just a minute or two until shrimp just turns pink on both sides. (You can add a little water to the pan if the shrimp starts to stick.) Add cream and parmesan cheese. Stir and heat until cheese is melted and the shrimp and sauce is heated through. Season lightly with salt to taste, if needed. 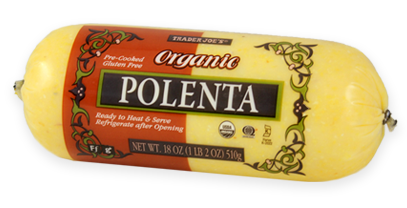 Put about 5 or 6 rounds of polenta on each plate. Pile with shrimp and sauce. Sprinkle with smoked paprika. Serve with a side of the greens. When I worked at the Olive Garden in college, the biggest temptation was the bread drawer, the place where the fresh-out-of-the-oven garlicky bread sticks keep warm until they are to be swaddled in cloth like little dough baby Jesuses and placed in a basket, then delivered to anxious guests alongside a family-sized salad with large clumsy tongs. Here’s a little server secret: to maximize your salad and breadstick dining pleasure, don’t bother asking for extra dressing or scooping up the last bit swimming at the bottom of the salad bowl. The real indulgence comes in dipping them into a boat of alfredo sauce, it’s a combination you won’t long forget. And the only thing it will cost you is $2.50, 380 calories and 35 grams of fat! Yeah sorry….total buzz kill. But good news is ahead. 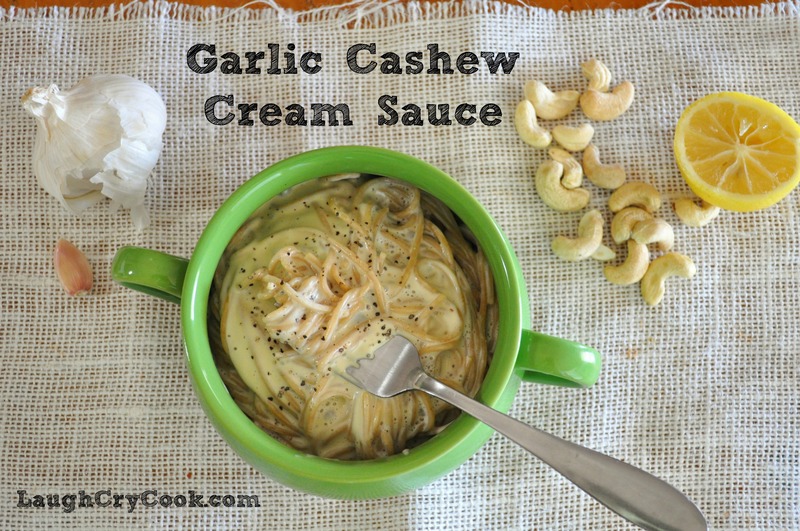 This morning, an idea for a simple garlic cream sauce recipe popped into my head. It sounded so easy that right there at 10am, I whipped it up in my Vitamix. And when I opened the blender top ten minutes later, the steaming creamy sauce brought me right back to my shifts at the OG. The smell of garlic filling the air as you opened the bread drawer and winked to the cook for a little ramekin of alfredo. The combination so naughty, yet so irresistible. Hungry servers gathered around to share the quick indulgence, all the while looking out of the corner of our eyes to make sure a manager wasn’t swinging through the kitchen door or the skinny girl with self-control wasn’t looking down on us with judgement. 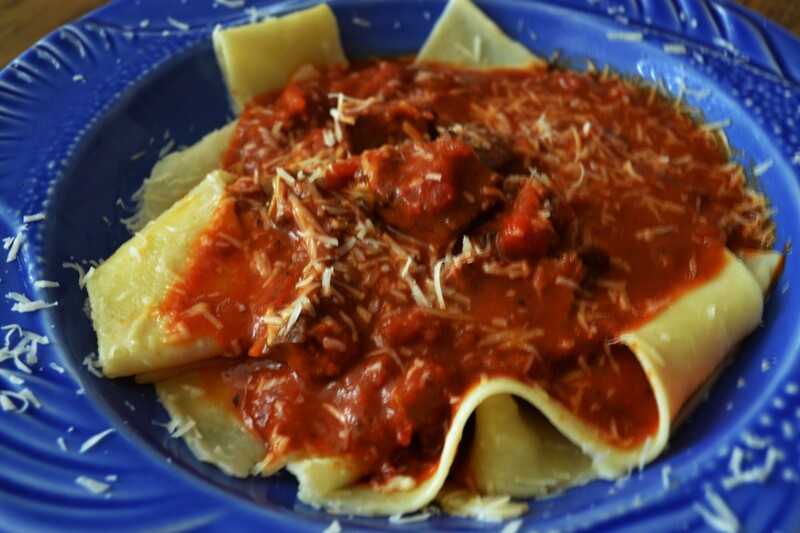 Somehow this sauce captures that naughty thrilling indulgence – the taste of garlic and cream dancing on your tastebud – but it’s oh so right in so many ways. No oil, no dairy, no cholestorol, just healthy fats from cashews. And with a rich creamy sauce like this, who really needs a refined white flour breadstick to dunk in it? Serve it over whole wheat pasta or vegetables or dip your favorite toasted whole grain baguette in it and you’ll be every bit as satisfied. 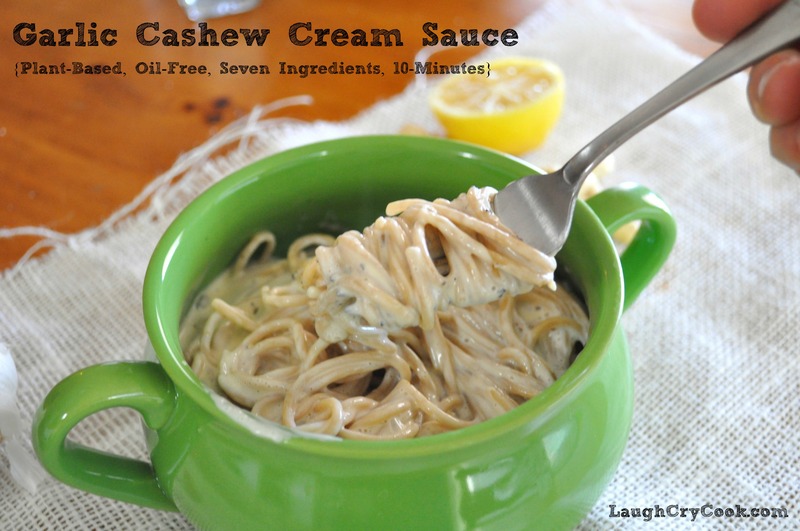 It’s mind blowingly delicious and the easiest cream sauce I’ve made yet. I see many spin-offs of this in my future. 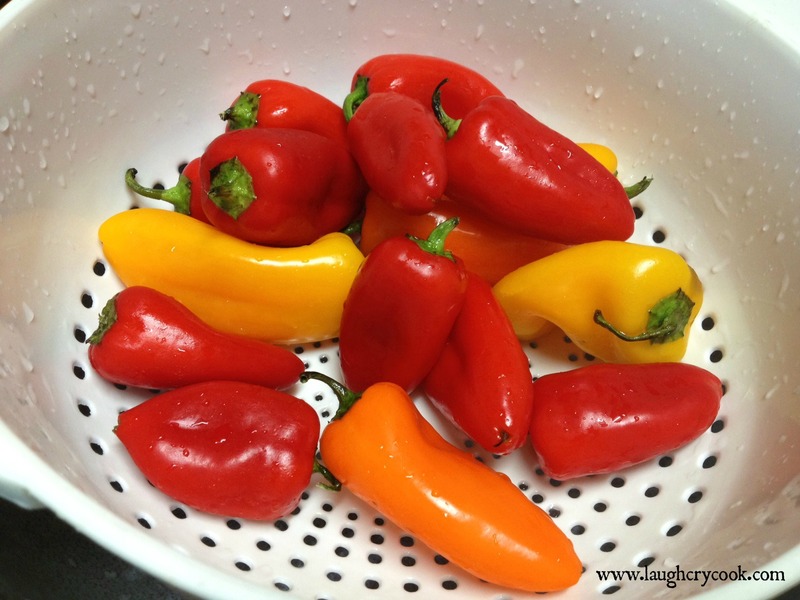 Add a little cayenne for some heat, roast the garlic, garnish with some basil to brighten it up for spring, maybe even add some spinach and artichokes and cook it down to a thick appetizer dip. Oh the potential! Note: I did not pre-saute the garlic, so it has a little bit of that raw garlic bite…that will stay the evening with you. I am a sucker for garlic, but if you like your garlic a little more milder and not as an overnight guest, then you may want to mince and saute it in a touch of water or olive oil before adding it in. 1. Blend cashews, nutritional yeast, and 1/4 teaspoon of salt into a powder. Scrape corners down. 2. Add garlic, cornstarch, 1/2 of milk. Blend until combined. 3. Add remaining milk and blend on high speed until hot and steamy (about five to seven minutes) and to the thickness desired. 4. Blend in lemon juice and check for seasoning. Add more salt if desired. 5. 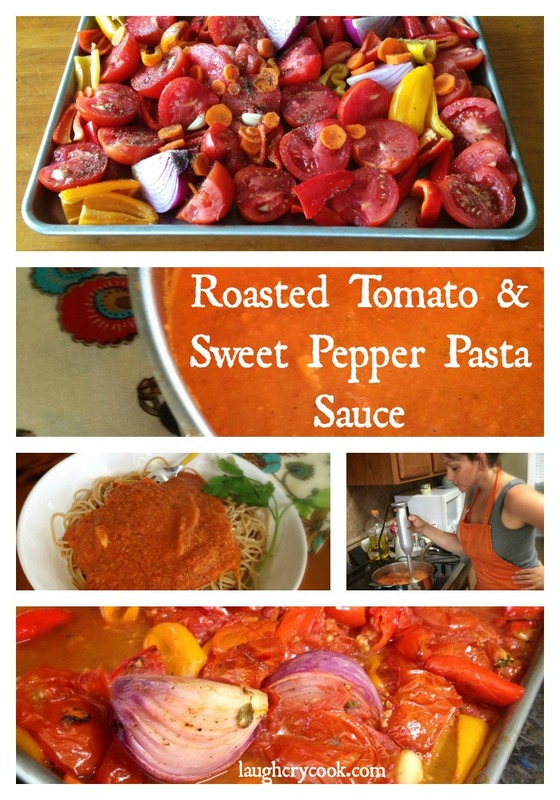 Serve over pasta or vegetables or as a dipping sauce for bread. Sprinkle individual servings with a touch of pepper. Vitamix is having a sale on their reconditioned models this month (January 2014). I bought the standard reconditioned model in November when they had the same sale and have officially fallen into the “How did I ever live without it? !” camp. 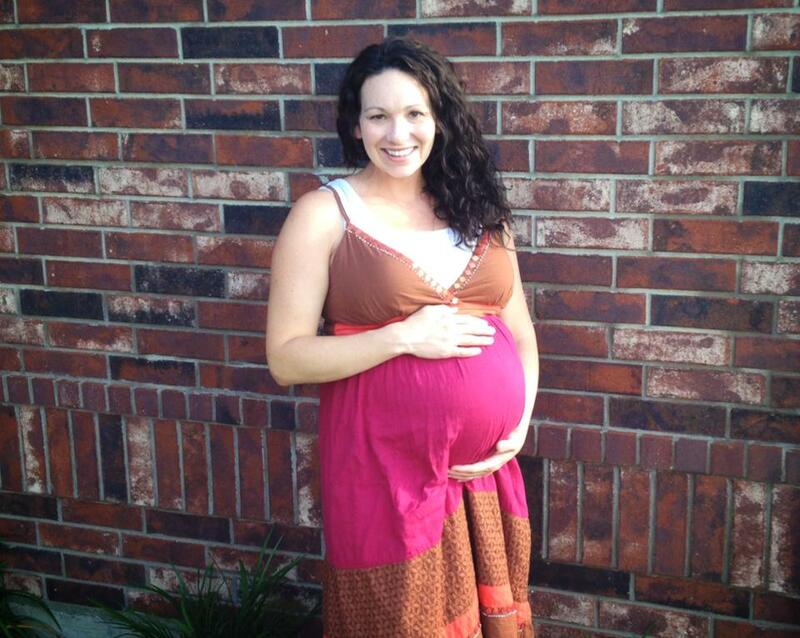 You can use the code 06-009318 at Vitamix.com to get free shipping and to help support Laugh, Cry, Cook. 1. In a food processor blend cashews, nutritional yeast, and 1/4 teaspoon of salt into a powder. Scrape down sides as needed. 2. Mince garlic finely or use microplaner to grate into food processor. 3. Stir cornstarch into 1cup of milk. Add to food processor and blend until well combined. 3. Add remaining milk. Blend again. 4. Transfer to stovetop sauce pan and heat on medium to medium high, stirring often until it is heated through and reached the desired consistency (like a thick alfredo sauce). 4. Stir in lemon juice and check for seasoning. Add more salt if desired. There comes a time in every gardener’s life when they ask themselves, “What am I going to do with all these tomatoes?” And until that day comes for me, I will pull up my dead plants with my black thumbs, quietly curse those gardeners under my breath, and smile graciously when they offer up some of their overwhelming bounty to me. I’ll display them on the counter for a day or so until I can’t take their mockery anymore. And then I will cook my way out of despair. And remember the gifts I can offer my family, even if a plentiful vegetable garden is not one of them. Instead, I will slow roast my way into their hearts with sweet peppers, carrots, onions, and garlic (store bought, but flavorful nonetheless), garden tomatoes (generously given to this less fortunate gardener), and a few sad looking twigs of rosemary and oregano (just barely surviving in my garden of doom). And I’ll bring those flavors together in one delightful pureed sauce. My husband will declare that he may never eat jarred sauce again. 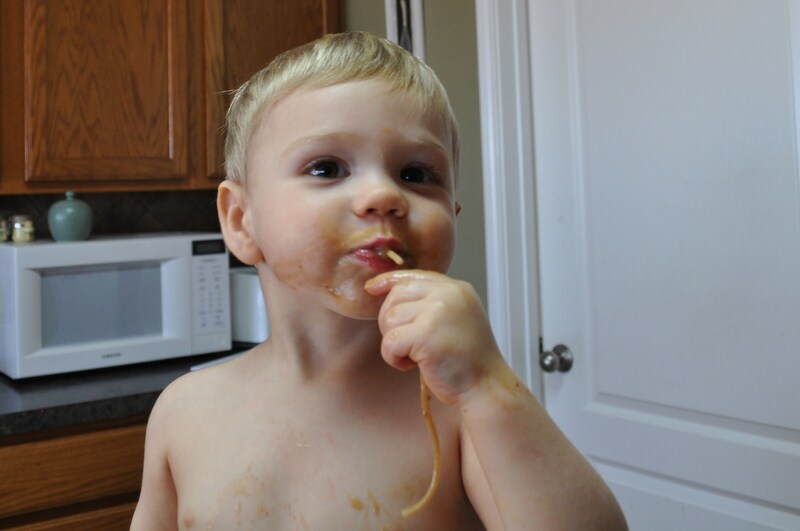 My toddler will slurp his pasta up with messy reckless abandon. And I will stand over the pot eating the sweet rich roasted sauce by the spoonful, my self esteem having made a complete (near manic) turn for the better. For those of you who feel the need to do something good and right by your family, I give you this recipe. It will restore their faith in you, and your faith in yourself. Heat oven to 400. 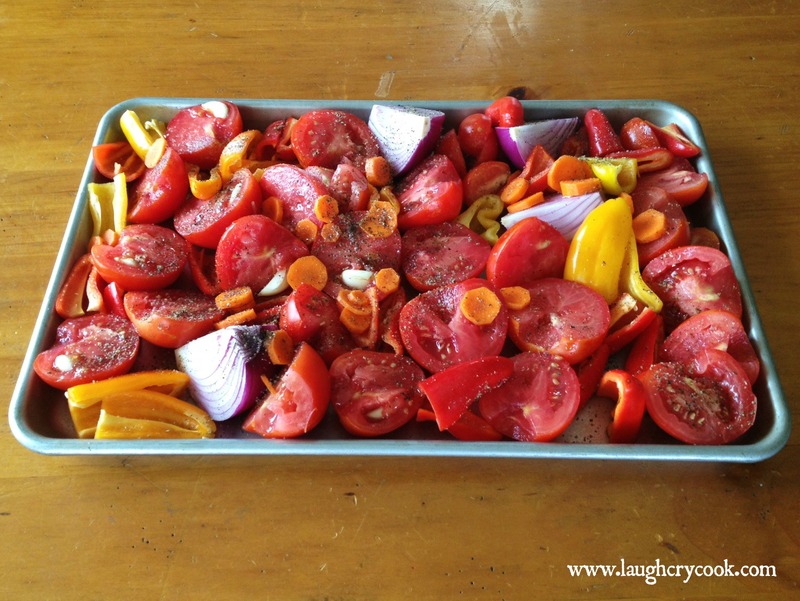 Put chopped vegetables and herbs on a large deep-sided roasting pan or dish. 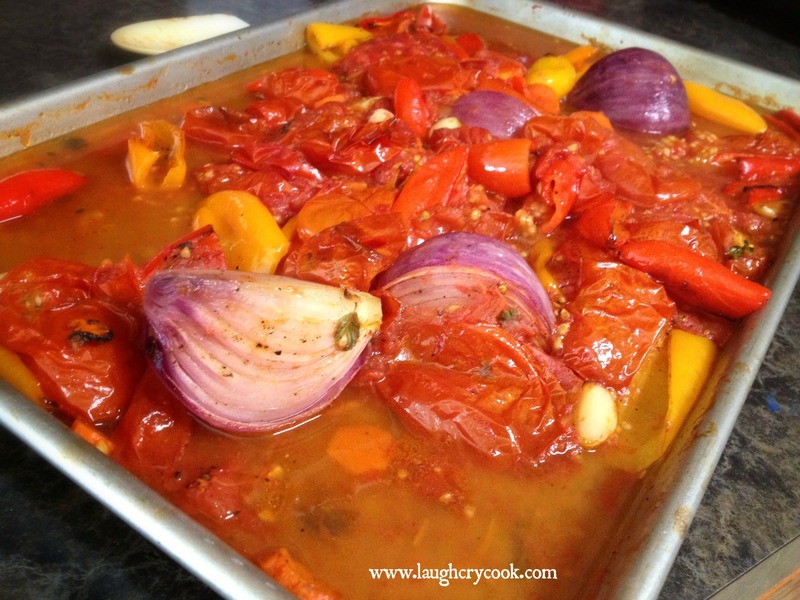 Stuff the garlic cloves into the tomatoes so they don’t burn. Drizzle with olive oil and toss with salt and pepper. Roast for 45 minutes, stirring every 15 minutes. 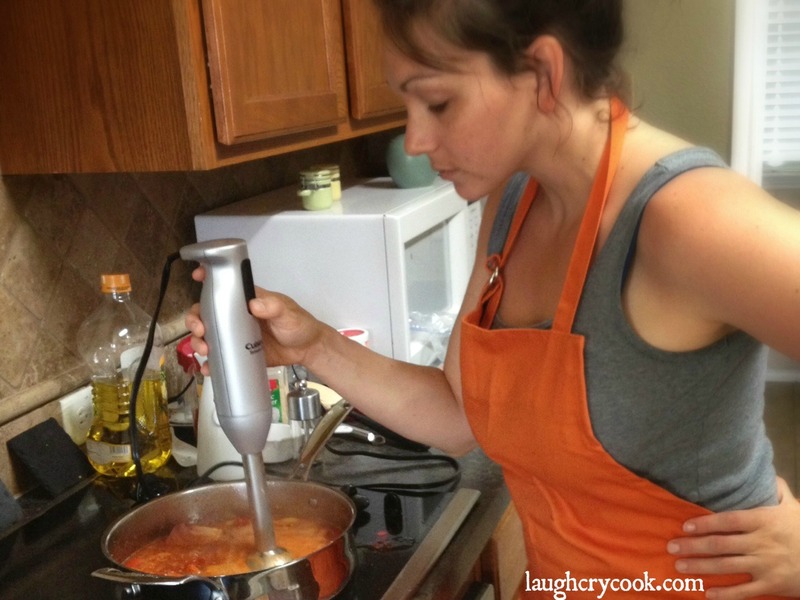 Carefully pour the veggies and their sauces into a pot on the stove and use an immersion blender to puree the vegetables. (If you don’t have an imersion blender, let the veggies cool to room temperature, then transfer to a blender or food processor and puree. Then pour into a pot on the stove.) Add parsley, salt, and molasses. Bring to a boil and then reduce to low heat. Simmer for 30 minutes. My sauce was thick already, so I simmered with the lid on, but if you have really juicy tomatoes, you may want to simmer with the lid off until you reach the desired consistency. Check for seasoning. Adding more salt or molasses (adds sweetness and cuts acidity) as needed. Make it Salsa: This base recipe could easily be turned into a salsa by switching up the seasonings — add a few jalapenos and cilantro, omit rosemary, oregeno, and parsley. Pulse in the food processor for a chunkier version. Would be delicious served hot or cold with chips. 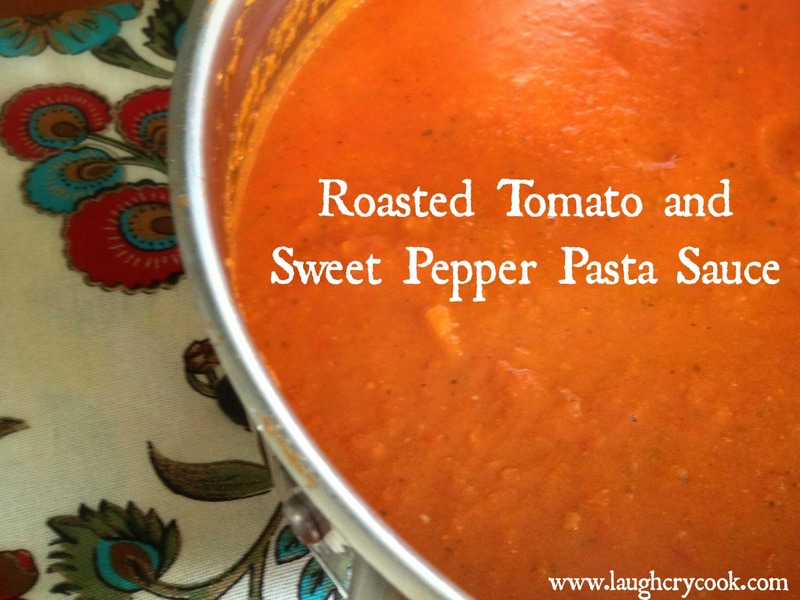 Make it Soup: Add a little broth or cream for a delicious roasted tomato and pepper soup. Make it a Meal: While you’re simmering the sauce and the oven is still hot, roast up some chickpeas tossed in olive oil and Italian seasoning for a crunchy protein-filled topping. Wilt some spinach into the sauce in the last five minutes to sneak in some greens. 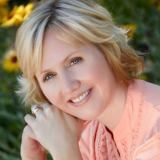 (Becky) I’m thrilled to share our blog today with new author, compassionate therapist, and dear friend, Lucille Zimmerman. We’re celebrating the fresh release of her new book on self-care for women titled Renewed: Finding Your Inner Happy in an Overwhelmed World. Seriously, you gotta get this book. 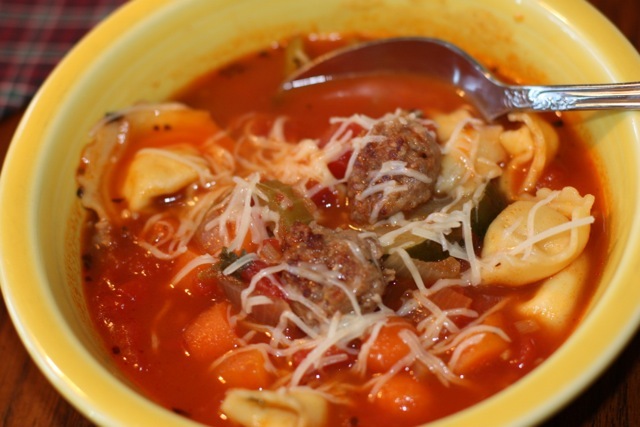 Even better, pamper yourself futher and read it while you sip her comforting recipe for Tortellini Soup with Italian Sausage. 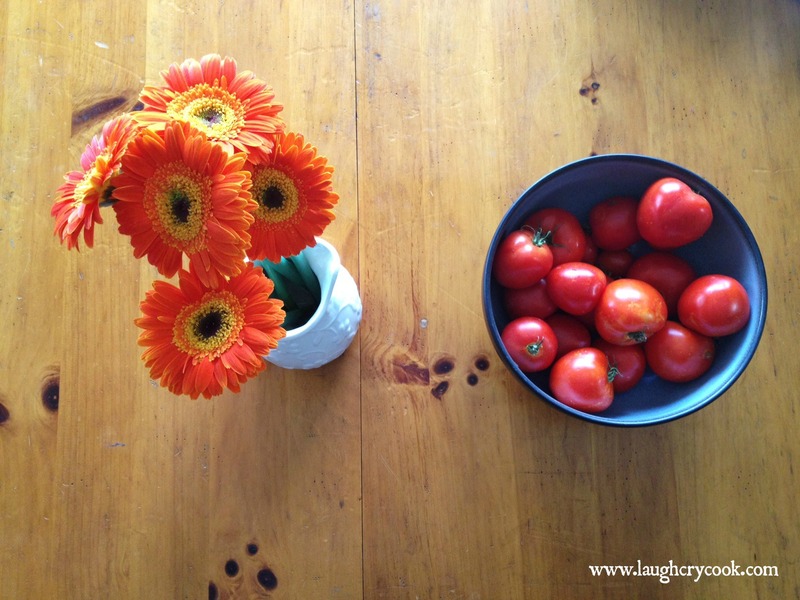 Below are some personal words, a short excerpt on self-care and Lucille’s soup recipe. 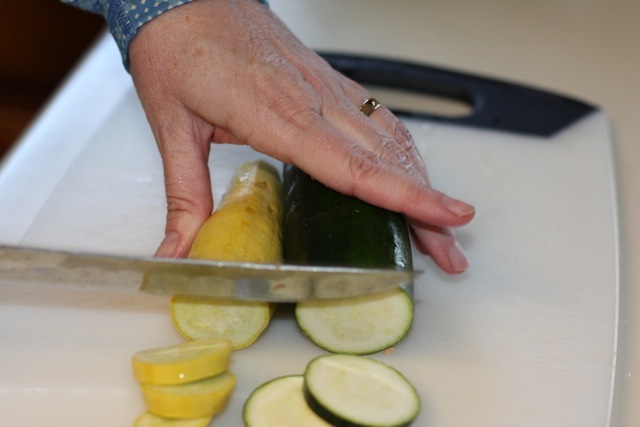 One of the reasons she loves it is because it allows her to chop veggies, a calming and centering activity for her. Enjoy! I’ve noticed I’m the most stressed when I can’t focus on one thing. Right now I’m trying to finish up the grades on the counseling course I taught, I have a series of blog posts that need written, a daughter who is planning a wedding but is prohibited from driving until medical tests prove she’s not having seizures, and I’m launching my first book. Needless to say, the multitasking is causing me stress. I am in need of solitude. So what do people gain from spending time in solitude? One researcher said the mere presence of other people obliges us to coordinate our actions. Right now I am alone. Snow is falling silently outside and the only sound I hear comes from water trickling in my office fountain. Right now I can do whatever I want. I can slurp my split pea soup while taking intermittent bites of a chocolate bar. I can sit on my chair with one leg tucked under in unladylike fashion. I can take a break to let the dog out, and I can sing badly while doing all of the above. I’m still wearing my workout clothes from yoga, my bangs are hanging in my face, and I don’t have on a stitch of makeup. These little freedoms are not to be underestimated. Humans may be social beings, but solitude has been shown to have great societal value. It is like the rests in a line of music, giving information, nuance, and structure to the melody. Without it, our lives are a cacophony, a never-ending noise that wears us down. Solitude is essential for our spiritual experience – it is where we hear the still, small voice. Jesus was our model, showing us how to balance being with people and being alone. ‘Very early in the morning, while it was still dark, Jesus got up, left the house and went off to a solitary place, where he prayed’ (Mark 1:35), and ‘Jesus often withdrew to lonely places and prayed’ (Luke 5:16). In these verses we see Jesus becoming known as a great healer and teacher, but he still took time to rest and pray. So in spite of my to-do list, I put everything aside and took a walk in the sunshine. 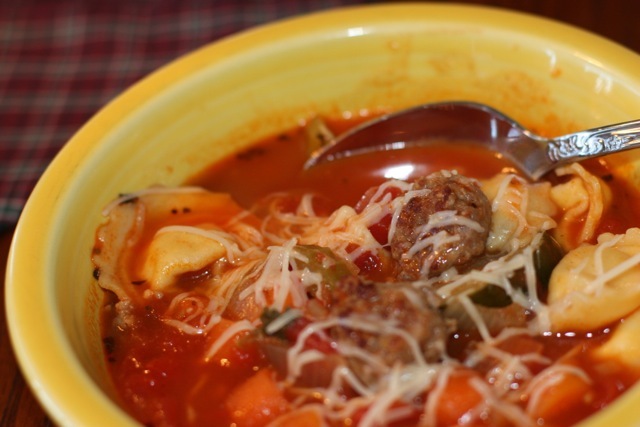 Then I made a tortellini soup. If anything brings my calm and focus back its sunshine, exercise, solitude and chopping fresh, colorful and fragrant vegetables. In a 5-quart Dutch oven, brown sausage. Remove sausage and drain, reserving 1 T of drippings. Sauté onion and garlic in drippings. Stir in beef broth, water, tomatoes, carrots, celery, basil, oregano, thyme, tomato sauce, and sausage. Bring to a boil. Reduce heat and simmer uncovered 30 minutes. Stir in zucchini and parsley. Simmer 30 minus. 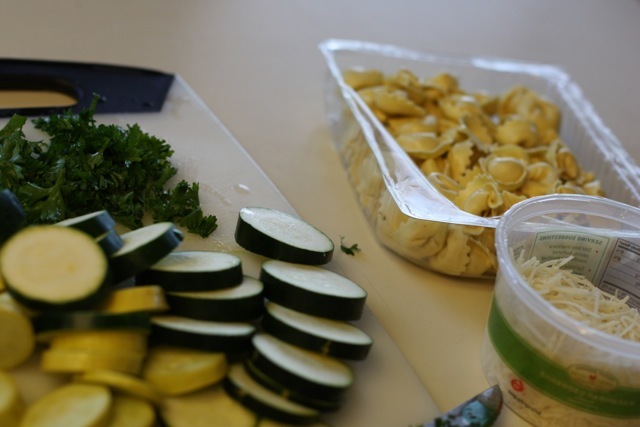 Add tortellini last 10 mins. Sprinkle with Parmesan cheese. Once upon a time, there was a girl who didn’t like mushrooms. 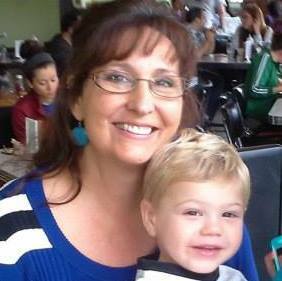 She took much care to avoid them until one day, her restaurant manager made her taste Chicken Marsala. She tasted the chicken with the sauce and pushed the mushrooms to the side. The sauce was heavenly. On her lunch break, she craved that yummy rich sweet sauce, so she ordered the Chicken Marsala without the mushrooms. She was sad. The sauce was not the same. Maybe, she thought, I do like the taste of mushrooms but not mushrooms themselves. The next day, she ordered it again and ate around the mushrooms. The sauce was delightful once again. It seems mushrooms added a depth of flavor she loved. She often rewarded herself at the end of a long waitressing shift with her new favorite dish. As time went on, she got brave and occasionally tried a little bite of mushroom with the chicken. Maybe, she thought, I do like mushrooms … but only in this dish. 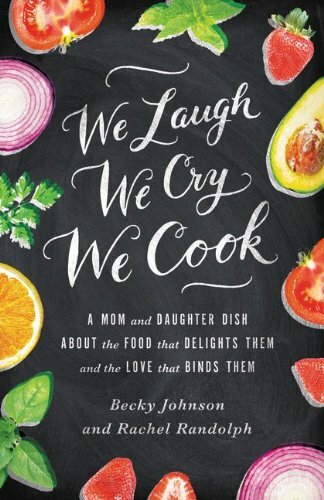 Years later, the girl gave up meat and found that mushrooms were actually delicious in many dishes if you know how to cook them. 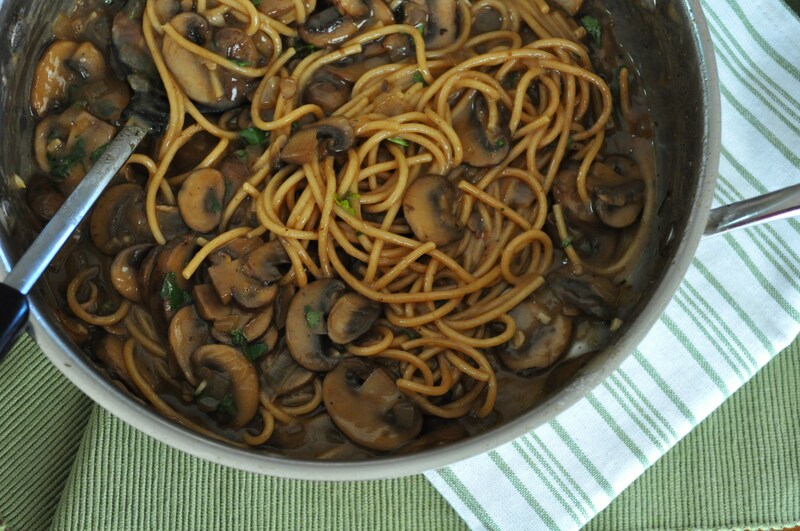 Now that she loved mushrooms, she was sad that she missed out on the best part of chicken marsala for so long. 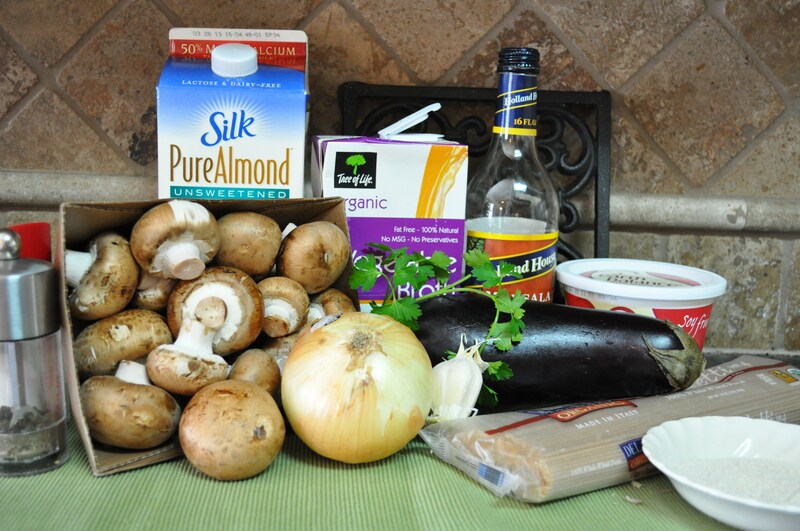 So she decided to make a vegan ‘chicken’ marsala using crispy eggplant. It was everything she hoped it would be and more. And she was very happy. 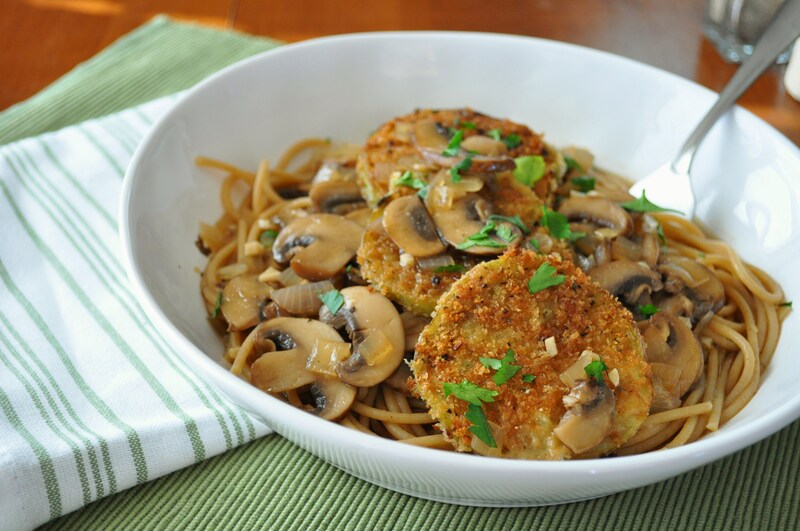 A vegan twist on the dish that first made me swoon for mushrooms. Most of the ingredients. I modified a few things as I went though, like leaving out the milk. Place eggplant in colander or between paper towels and sprinkle it with salt. Let sit for at least 30 minutes to remove moisture. Pat dry with clean paper towels when done. 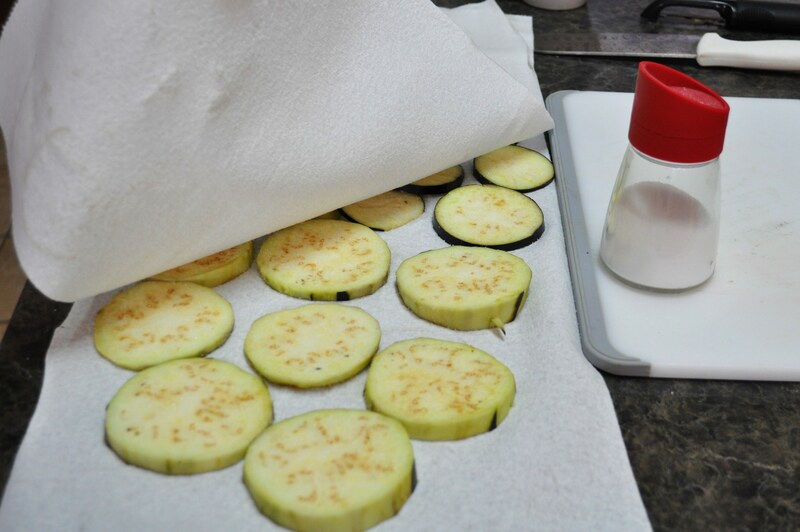 Salt the eggplant and let rest between paper towels or in a colander to remove excess moisture before frying. Makes it crispier! Heat a large skillet (preferably heavy stainless steel or iron) on medium high heat. Add Earth Balance and olive oil and let it heat up. 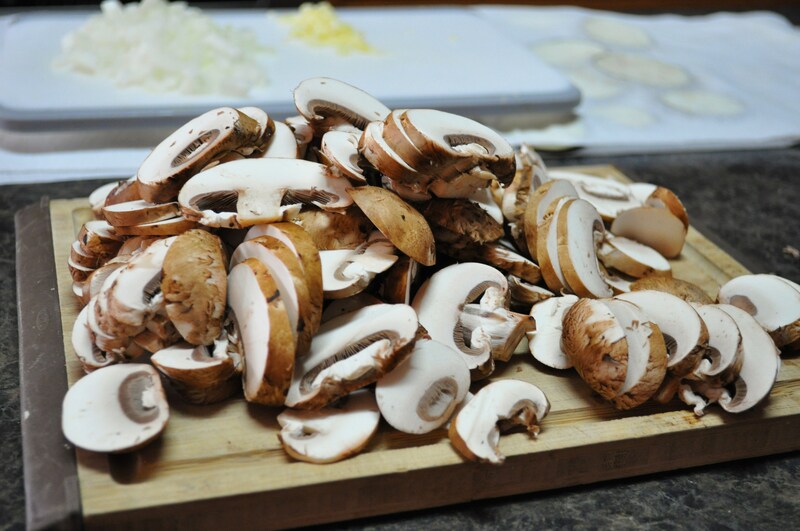 Add mushrooms and cook until they’ve browned and shrunk quite a bit in size. Stir in onions and garlic, reduce heat if needed so garlic doesn’t burn, saute for 2-3 minutes until soft. Pour in 1/2 cup of wine and scrape up all the brown bits on the bottom of the pan. Stir in one tablespoon of flour and slowly add the rest of the wine and veggie broth. Cover and bring to boil. Reduce to simmer, remove lid and simmer until liquid is reduced to about half. If it’s not thick enough, stir in a little more flour and keep cooking down. Season to taste with salt & fresh cracked pepper. Stir in pasta noodles and cover to keep warm. 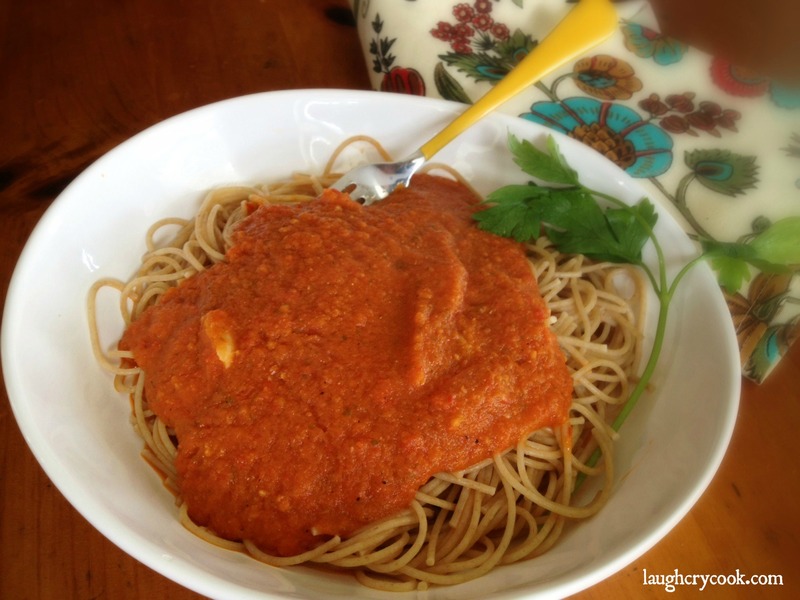 The sauce should be thick enough to cling to the noodles. In another skillet, heat a thin layer of olive oil (or your choice of oil) on medium heat. 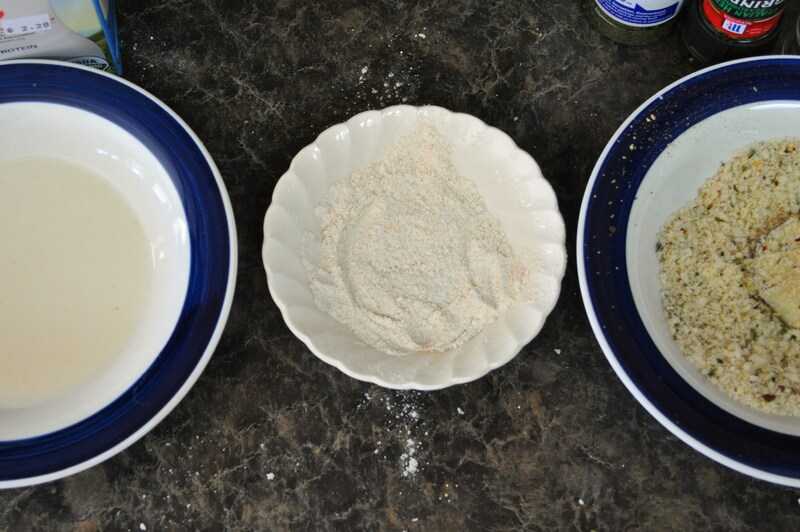 Set up an assembly line with shallow bowls of flour, milk, and seasoned panko bread crumbs. Dip eggplant slices in milk, then flour, then milk again, then bread crumbs. Put in single layer in the oil and cook for about 2 minutes on each side, until crispy and golden brown. Remove slices to a paper towel lined plate. Repeat in batches until all eggplant is cooked. 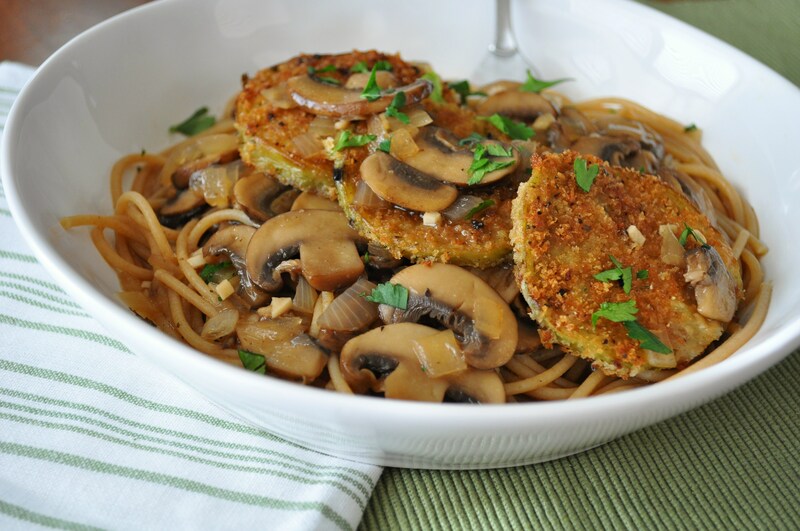 Serve the marsala pasta topped with crispy eggplant and sprinkled with parsley. 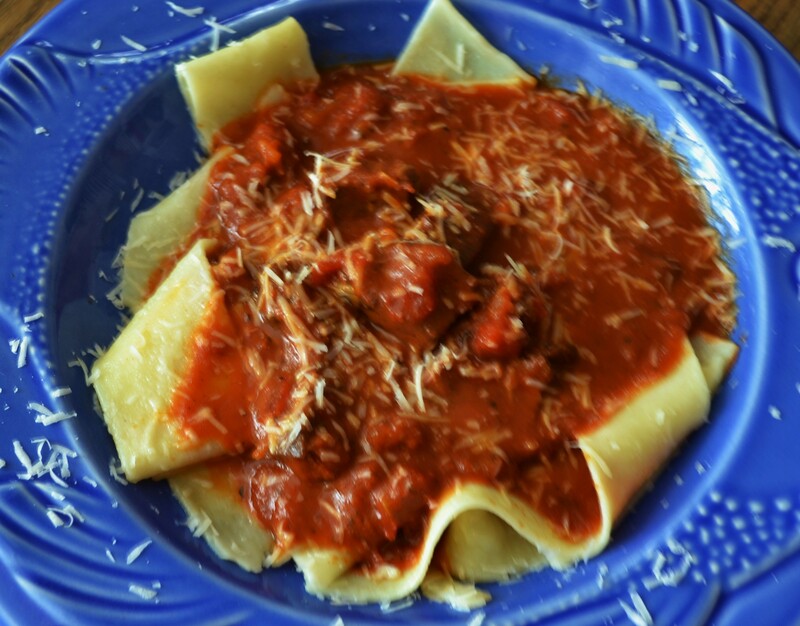 Or serve the eggplant to the side of the pasta if you want to keep it crispy longer.